DC members: log in first for full access. e-First articles are articles for the forthcoming issue. These articles have been edited and released online to make their content available to users as soon as possible. Once all articles for an issue are ready, the articles will be moved into the appropriate issue. e-First articles are considered the official version of record and may be cited. 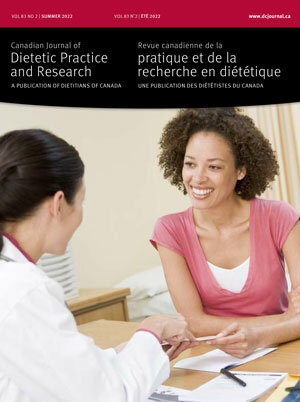 The latest published issue of Canadian Journal of Dietetic Practice and Research . 01 December 2018. This list is updated daily based on the volume of full text article downloads over the past 2 calendar months. Most Cited articles are updated on a monthly basis and available as Last 3 Years and All Time lists.